I know you’re like me and sometimes you find a recipe in a magazine or on another blog and you can’t get it out of your mind. That’s how I felt with Roasted Zucchini and Ricotta Sandwiches. I could not stop thinking about how awesome this sandwich might taste. You see I’m a roasted veggie junkie, and my veggies of choice most times are zucchini and yellow squash. Roasting veggies brings out their flavor big time and it’s such an easy way to prepare veggies so you don’t have to babysit while they cook. I loved it! As I’m continuing my journey on eating healthier (most days!) and working out, my body craves veggies big time. Don’t worry, I’m not giving up a juicy burger any time soon, but this sandwich was just as satisfying and filling as any meat counterpart. I’ve already confessed my love for roasted veggies, but I also love cheese. 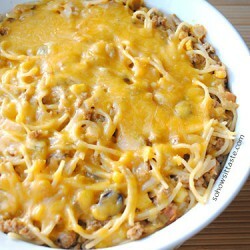 Lots and lots of cheese! 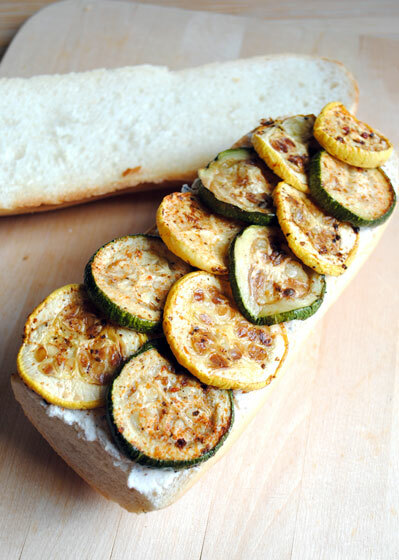 This sandwich is a win win win with it’s zucchini (I added yellow squash, too), cheese, and bread. I tried it on wheat sandwich bread, but it really needs something bulkier like French to hold it. 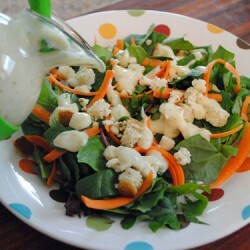 Plus I really liked the crunch from the French bread in contrast to the soft cheese and veggies. I made a few changes to the original recipe as noted below. 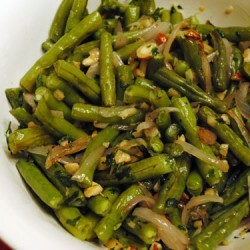 I used dried herbs for convenience, but you can choose fresh if you like. If the texture of ricotta doesn’t float your boat, put the mixture in a food processor and let it get fluffier and smoother. Cottage cheese would work well processed, too. I also skipped the salting step. I don’t have patience for all that and I’ve always roasted zucchini straight away. You’ll probably get a crisper zucchini slice doing the salting step, so I’ll leave that up to you to decide. Any way you make it, you’re going to love this sandwich! 4. Spread one side of bread with a generous layer of the ricotta mixture. 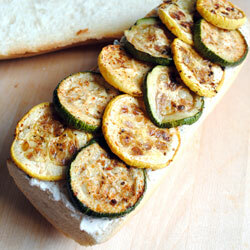 Layer with the roasted zucchini slices and place the remaining half of the bread on top. Serve immediately. Hi Leah, love roasted veggies, I do the same thing when I see a recipe somewhere, I start thinking about it until it happens. Love this combination! I’m with you. I love roasted veggie sandwiches and I love sweet zucchini, which I’ll bet tastes great with that ricotta. OOh, this looks wonderful! 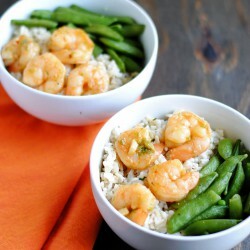 Even though I’m not a vegetarian, I still love veggie-heavy dishes and this one is right up my alley! Roasted veggie sandwiches are the best! Such a great summer time meal. Especially since my husband does all the grilling, so I just chop everything up, hand it to him, then relax on the couch with some wine. Haha! What a great idea for a sandwich! I love roasted veggies in salads and sandwiches.